Both the husband and I love this Kuih Seri Muka. 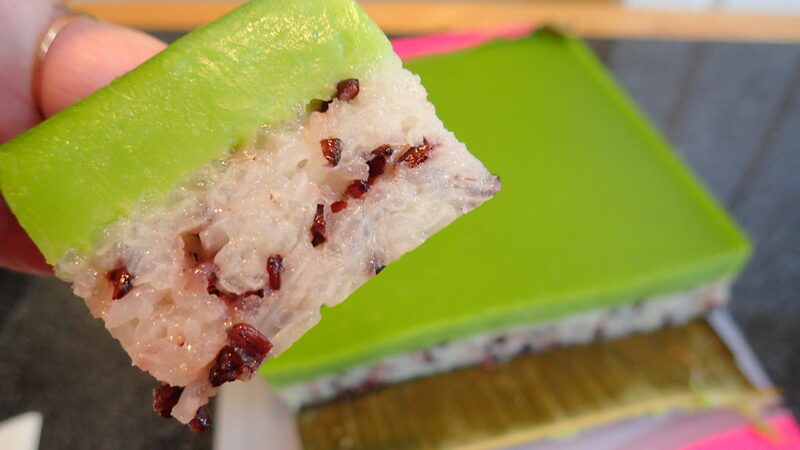 There is just something about glutinous rice, be it cooked sweet or savoury, something special. It is heart warming and comforting to me and I am just lucky the British hubby loves it too. 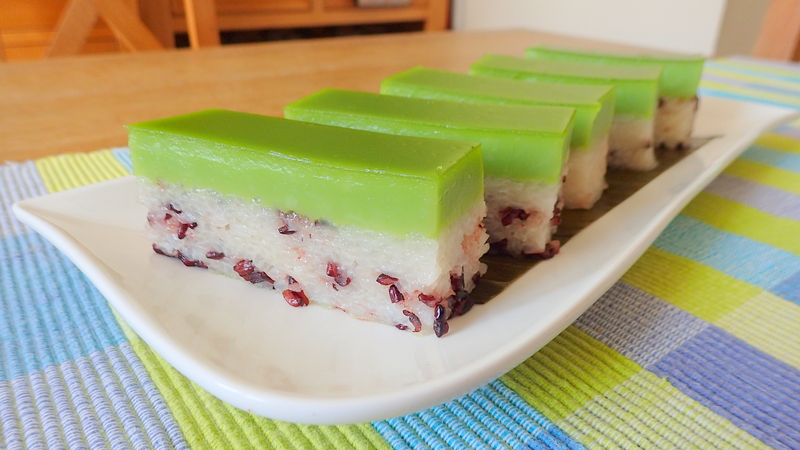 Kuih Seri Muka is one of our favourite. I have been thinking of making this for months. Much appreciation to my Facebook friend who makes this to sell for the invaluable tips she gave me. 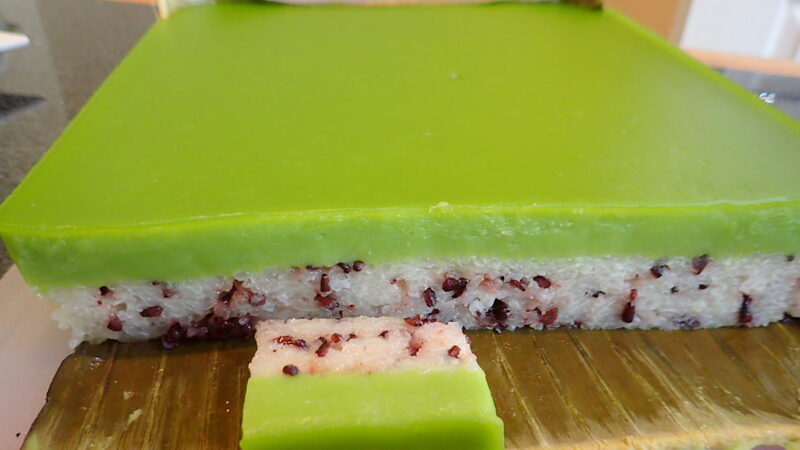 I have found the perfect combination in my opinion to the kaya layer that actually has a layer of dry ‘skin’ just like the traditional ones I have had eaten as a child growing up from the morning markets in Malaysia. I wanted to make this Seri Muka mine, a la Julie style and so I have to crank my brain. Luckily I love sitting and contemplating cooking, baking, plating up and anything to do with food. 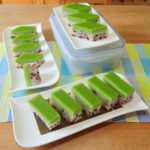 I decided to add black glutinous rice cause I wanted the colour to seep into the white glutinous rice to colour it pink a bit. However this time I think I have rinsed the black glutinous rice too much and the colour is not too pink. I will make again and update another picture as soon as I buy more glutinous rice this weekend. Hubby much prefer this to my Mango Sticky Rice recipe. Wash and rinse your black glutinous rice a few times and then place into a cup or bowl and filled with just boiled hot water to soak. Cover and let it soak for an hour. 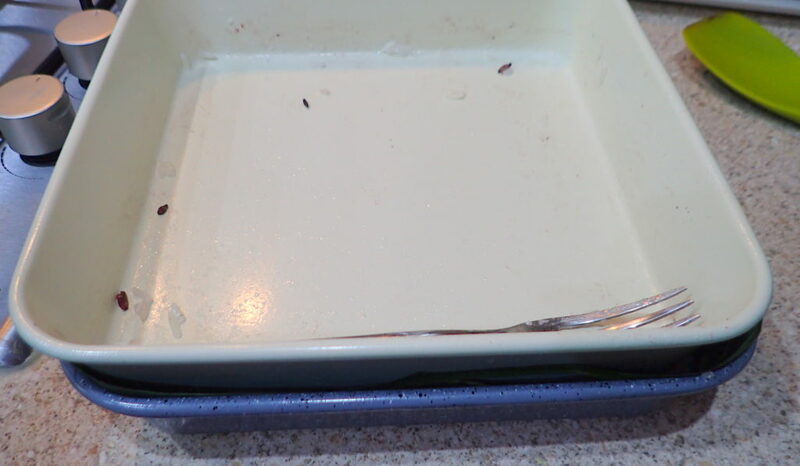 Remove and drain the rice with a sieve. 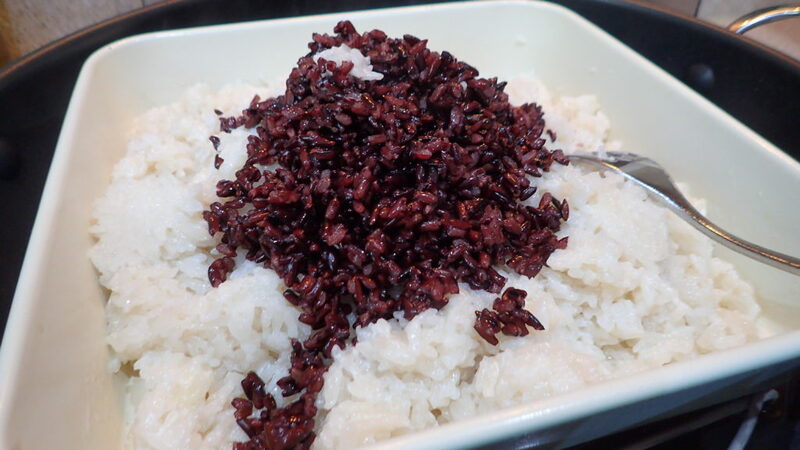 Place into a small pan and add 2 cups of just boiled hot water again with a pinch of salt and boil on low heat simmering for 25 to 30 minutes till the black glutinous rice is soft and tender. Keep in a container ready to use in the fridge overnight. Just rinse the rice once then soak in cold water overnight in a covered jug. 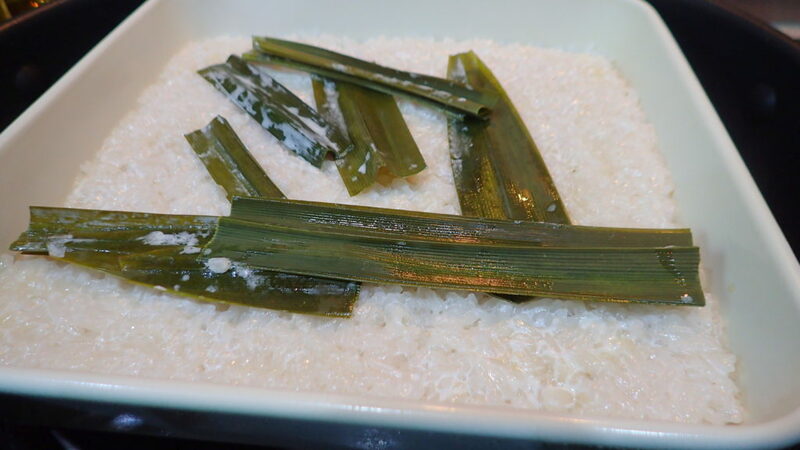 After 20 minutes you will see the colour of the pandan leaves have changed to a ‘cooked’ look. Remove the leaves and fluff the rice. It is at this point that you add in the black glutinous rice. Mix it a bit. 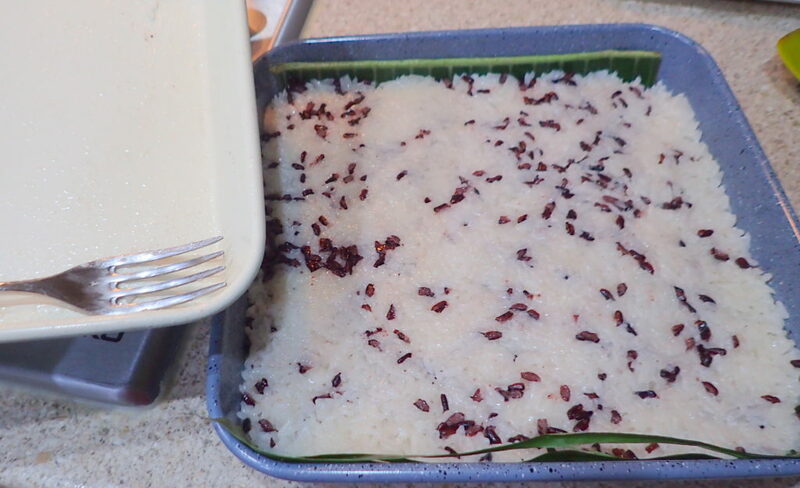 Transfer your glutinous rice to another prepared dish 9″ x 9″ which I lined with a banana leave. I just love the extra flavour. You do not have to do this if you can’t. Press the rice down, Use a kek lapis press or failing to have that handy use a potato masher. I use the back of the first tin. Steam again for another 10 minutes on low heat. 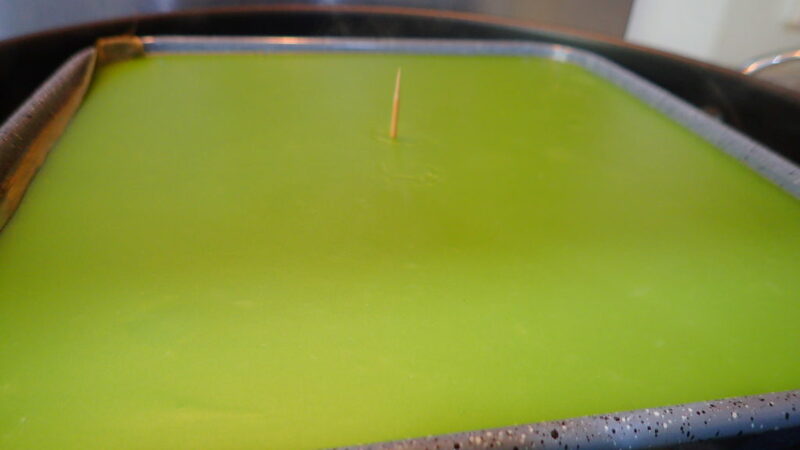 While the glutinous rice is steaming make your top layer. 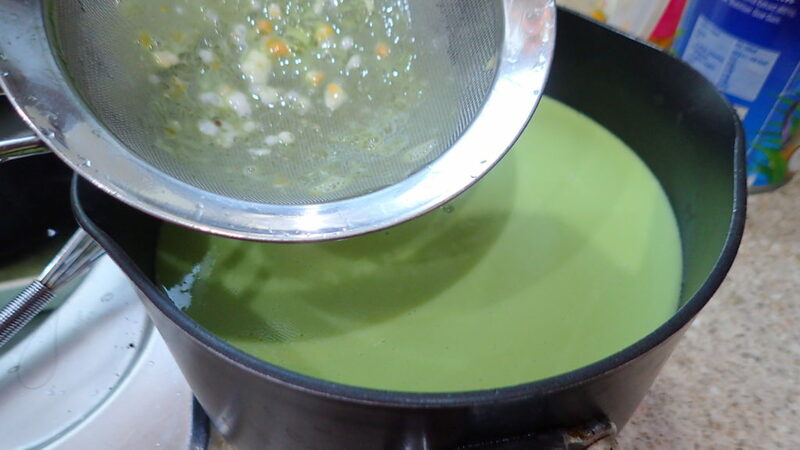 Start by snipping the rest of the pandan leaves and add in 80 ml water to get 60 ml juice. Mix the 3 flours, sugar, eggs, coconut milk and pandan juice together. Use a whisk and whisk a bit till sugar all dissolve. 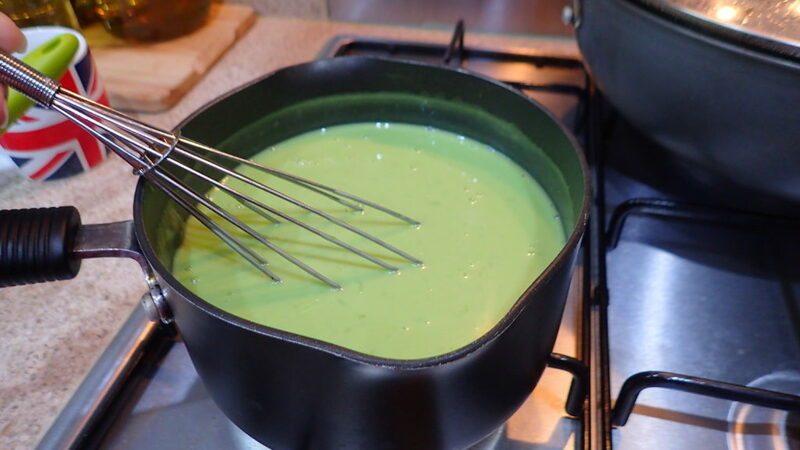 Sieve the mixture and then on low heat cook it stirring all the time. 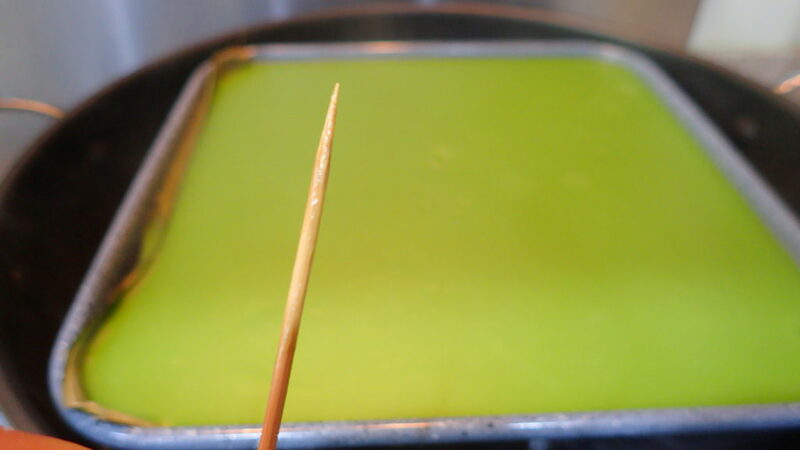 When mixture coats the back of a spoon it is ready to be poured on top of the prepared glutinous rice. Steam for 30 minutes on low medium low heat. As advised by my friend, for the first 15 minutes remove the lid and wipe off the condensation every now and again. Do not walk away. BUT I stayed the entire 30 minutes and wipe away. Then I removed the lid and turned off the heat and let it dry off for a few hours before slicing.